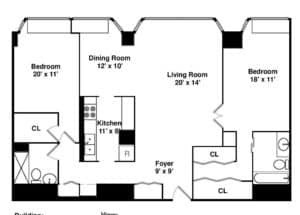 One of our client from Chicago has sent us a floor plan of few apartments for the quick evaluation and advice on a buying decision. Staying in vastu friendly home is more relevant nowadays since modern gadgets & technologies have changed the energy equations in our personal environment. The entrance of the apartment in the south-east zone of the south in Part-3/4 is auspicious as per vastu. The main door is an entry point for all positive energy to flow into your home. Bathroom at East corner may impact on the social connectivity of the person staying in the house. The bathroom is regarded as energy robbers since its location is in the health affected zone. Yet simple vastu solutions may be helpful in energy corrections. Kitchen in the south zone may result in serious illness and lack of energy all the time. Healing kitchen crystals also can be used to improve the kitchen energy. 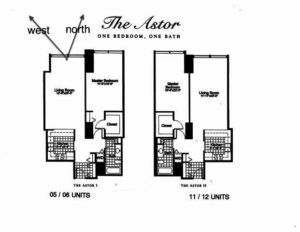 Living room in the south-west and bedroom in the northeast is just opposite locations according to the vastu. As a result, water element & Earth element losses its strength. Due to multiple defects, this premises does not fall under vastu compliant property & hence should be rather avoided. The entrance of the apartment in the south-east zone of the south in Part-3 is auspicious as per vastu. Bathroom at south corner is in a netural zone as per vastu & is not harmful. Kitchen in the south-east zone is correct as per vastu. This may be the strongest point in the above apartment, probably enhances the vastu strength of the house. Finally, Living room in the Northeast and bedroom towards the Southwest zone are placed as per vastu requirements. Entrance towards the north indicates growth in career. It brings unlimited opportunities and financial gain to the owner of the house. In addition to this, door opening in a clockwise manner indicates life in the right direction. Bathroom towards the northeast is a serious vastu defect. It should be removed & this area can be used for walk-in wardrobe. Bathrooms & toilets often have a bad reputation in terms of vastu planning as they are seen to drain energy when placed at the divine corners. Therefore it requires a serious attention & bullet vastu remedy. Living in a vastu -friendly premises & carrying out vastu space healing correction is the easiest way to enhance good fortune. Good health comes from more than daily food. An ancient tradition teaches us how to organize the spaces we live in harmoniously, in a way that is healthy for the body and mind. In the above layout, correct kitchen with the vastu fire paintings. Place bed with head towards the east wall. Avoid sleeping extremely in the south-east zone (fire element) because it could affect the health seriously. Since there is no window or opening towards the east, a beautiful painting of sun is recommended on the east wall of the bedroom in the south-east. Use pistachio green shade in the south-east bedroom. Hence it could reduce the severe impact of fire element in the south-east bedroom. Finally, a brown or yellow, either or combination of both is a good color for the south-west master bedroom, since they represent vastu element earth. As a result, this is an average space to stay according to vastu & therefore good for short period stay.